It's Facebook Fridays! for August 31, 2018; There is power in the written word, and when you learn the art of petition writing, your ability to cast spells will be greatly enhanced. This week the Lucky Mojo Curio Company is holding a random drawing to give away 4 enlightening spiritual supply prizes that will help you master the traditions of written and inscribed spell-work. 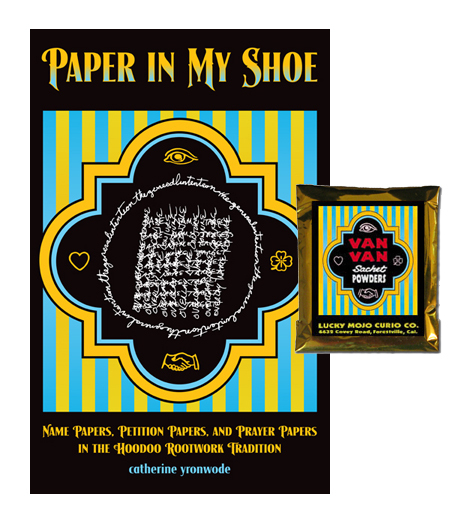 This week each lucky winner will receive a copy of catherine yronwode's instructional book "Paper in My Shoe: Name Papers, Petition Papers, and Prayer Papers in Hoodoo, Rootwork, and Conjure." Along with this practical guide to folkloric occult practices, each winner will also receive a packet of hand-made Lucky Mojo brand Van Van Sachet Powders, to dust your printed prayers for positive changes and benefits. First thing tomorrow morning, we will select FOUR winners at random, announce their names here, and ask them to message the Lucky Mojo Facebook Page with their mailing addresses, so we can send them their FREE Petition Mastery products. Am I too late for this giveaway? No, you are not! The winners will be selected sometime in the next few hours (between ten and noon, California time) on Saturday. We have a winner! In fact, we have 4 lucky winners! Our Facebook Fridays! winners for August 31, 2018 are: Delia Mendoza Boyden, Hunter Trombetta, Gata Pantera Negrra, and James Hague.